Our little Sexton -- sings. 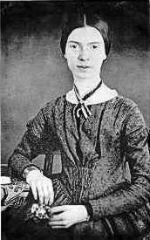 Here Emily Dickinson seems to suggest that true worship occurs at home -- or within oneself -- rather than in the public domain of church. She celebrates a worship that is simple, essential, direct. For her, trees form the roof of her church ("an Orchard, for a Dome"). The living world near-at-hand is her place of worship. Local songbirds form her choir. It is in her solitary moments and her private communions with nearby nature that Dickinson encounters the sacred. She finds within this interior world that God preaches to her directly -- "a noted Clergyman" indeed! The journey to heaven has become a part of her, it fills her entire world. It is not relegated to the future, after death or at some end time, but a continuous unfolding in the present.